Here we are in the middle of an artic blast that has the water on the Chattahoochee down to 32-33 degrees, so you can't really expect to catch any trout right now, right? Well on Sunday Jan 10th, I took Bill and Mary Davis from Decatur and their friend Anders Christensen from far away Copenhagen, Denmark out on a Gilligan Special. They had originally planned to fish with our Blue Ridge store but due to the ice and snow couldn't make it up so they came to the Helen store, where the Hooch had warmed up to a blistering 33 degrees when we got on at 11am. 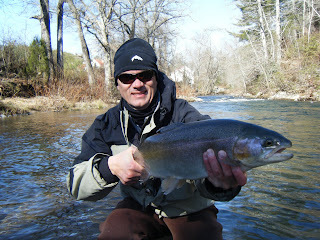 The day before, I told them that I promised nothing but cold feet and the opportunity to stand in the river and cast a flyrod. Well to my surprise the monsters of Nacoochee Bend were on the feed! My first cast of the day to demonstrate the ways of fishing with an indicator resulted in a 20" bow taking the fly and Mary putting him in the net. I am always happy to see the first one in the net, it relieves some pressure. Wasting no time, both Anders (see photo) and Bill put 24-inchers in the net, both solid 8-9 pound fish. In just 3 short hours of fishing, in only a couple of pools, we hooked up 15 or more fish. Almost all the fish ate large Prince nymphs with a few falling to pink San Juans or Rainbow Warriors. It might be cold and miserable to be outside but don't tell that to the fish, they are already cold but still hungry. Thanks to a wet summer and good management by Unicoi Outfitters, Nacoochee Bend has the most fish and the largest fish it has had in probably 4 years. Now is the time to come give it a try!